For a long time, age 75 was synonymous with the end of pension saving. That was the cut-off date when people could no longer contribute to a pension and by which point benefits had to be taken. While various legislation changes mean that is not strictly the case any more, age 75 still plays a significant role in pension provision. In theory, pension account holders can continue to contribute to their plan once they reach age 75. However, as they will no longer receive any tax relief on contributions, many pension accounts will not allow people to do so. Likewise, individuals no longer have to take benefits at age 75. But, again, that is in theory. In practice, it is worth advisers and their clients checking rules for individual pension plans. Some older-style plans may insist individuals buy an annuity by 75 or take their pension commencement lump sum. Or they may not offer flexi-access drawdown after that age. Where restrictions can be an issue, clients may want to transfer to a more flexible plan. If they do so, they should leave plenty of time before their 75th birthday. Impact on benefits One of the more significant changes at age 75 is the tax treatment of pension benefits on death. If the pension account holder dies before 75, benefits paid out should be free of income tax, if they are designated within two years of death. However, if they die after that age, benefits paid to beneficiaries will be taxed. Office for National Statistics data for 2017 shows over two thirds of deaths in England and Wales were people aged 75 or over (and three quarters of all women). In the run-up to age 75, clients may want to review who they have nominated to receive pension benefits, to make sure they can be passed on in the most tax-efficient way. This could involve changing the nomination from a higher tax rate paying adult child to a student grandchild, for instance. Lifetime allowance The other big change at age 75 involves checking against the lifetime allowance. 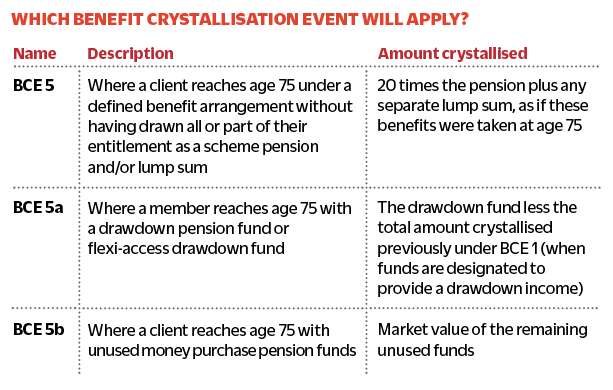 If a pension account holder reaches age 75 with uncrystallised funds or drawdown, they will be subject to an automatic benefit crystallisation event and potential lifetime allowance charge. The BCE that will apply depends on the type of pension benefits an individual has (see table). Any lifetime allowance charge at age 75 is 25 per cent of the pension fund in excess of the relevant lifetime allowance, as it is not possible to take any benefits in excess as a lifetime allowance excess lump sum. For those who have already designated drawdown, this means a second crystallisation event. This effectively tests any investment growth against the lifetime allowance by deducting the original amount designated for drawdown (not including any PCLS) from the current value of the drawdown plan. Mitigation options Those in danger of exceeding their relevant lifetime allowance may want to consider mitigation options. They could reduce any lifetime allowance charge by withdrawing more drawdown income in the run-up to age 75. That said, this may mean increasing the value of their estate. And, of course, tax is paid on the drawdown income. Or they could choose to change the investment strategy to adopt a more cautious approach. But this may mean missing out on potential investment growth, and it might be better to be taxed on part of investment growth, rather than risk losing it all. Alternatively, individuals may want to keep the pension fund intact, choosing to suffer the lifetime allowance charge. Funds can be retained in a pensions environment, which should be free from inheritance tax. At death, funds can be passed to family and taxed at the beneficiary’s marginal rate of income tax, which may be lower than the deceased’s. Age 75 is still an important milestone in pension planning and key decisions will need to be considered in the run-up to it.